I have no idea what this kid is thinking--and neither do you. Cards on the table: I'm frequently uncomfortable around teenagers. As an educator, this has been a hard thing for me to accept about myself. My initial training was to be a band director, more specifically, a high school (and hopefully, eventually, college) band director. I didn't really get to do that until 2011, when, coming out of the recession, I was hired back to Banks as a half-time middle and high school band and choir director. There I found many kids I liked and enjoyed working with, some who were difficult, and a few who scared me. More cards on the table: boy energy agitates me, sometimes to the point of shutting down. As boys get bigger, they also get louder, their impulses more dangerous. I've seen boys in the fifth grade (the oldest kids I work with, now that I'm an elementary music teacher, band together into disruptive proto-gangs. I've seen them play at, and sometimes actually engage in, acts of violence against each other, because it's fun. Given free rein, they'll scream, shout, even roar as they rush out to the playground for recess. 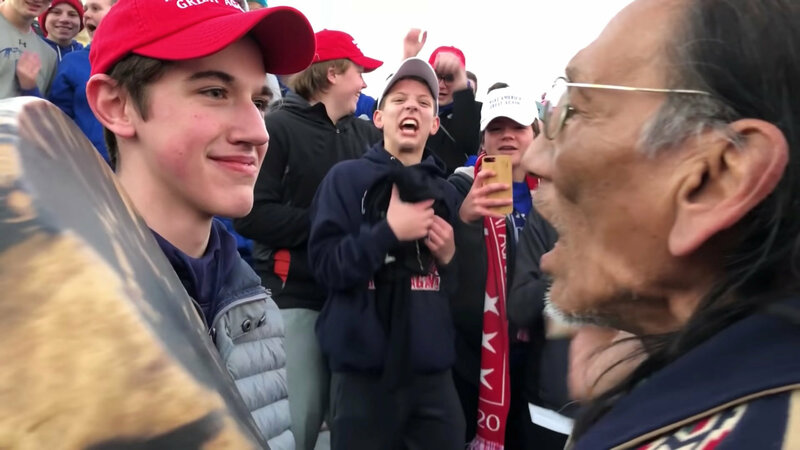 So there are two levels of discomfort I experience just going into the now infamous video of a complex confrontation between Catholic School teenaged boys wearing "Make America Great Again" hats, an intentionally confrontational group of African-American activists, and a Native American elder trying to defuse the situation with a drumming and singing ritual that was probably completely outside the experience of those boys. I don't approve of their diocese sending them to Washington to participate in an anti-abortion rally, in their supervisors permitting them to wear those inflammatory red hats, or the actions of the counter-protestors who were trying to get a rise out of them. I also think the elder was naive in thinking his own actions might help ease the tension: these naive kids didn't know what to make of him, and reacted based on their own ignorant understanding of what he was doing. I hope we're clear, then, in that the very presence of these kids in that place, for those reasons, at this time in American history was, in my opinion, a violation of their school's and church's responsibility for their education and formation as moral citizens and adults. But the smirk. Oh, that smirk. So much has been read into the expression on that kid's face, as all over the internet, people read into it entitlement, privilege, racism, misogyny. "I know that smirk," I've seen people I care about write on Facebook. They've seen it on the face of molesters, sexist bosses, clueless plutocrats, anyone who's every abused the privilege of being white, male, and well-off to disadvantage anyone whose gender, ethnicity, age, national origin, sexual identity, physical or mental ability, or any other factor puts them in a position of less power than the smirker. All the freight of those experiences of abuse gets loaded on this one image: a fifteen-year-old with an unfortunate expression frozen on his face, whether in actuality or by the bad luck of being in the frame of a camera at this precise moment. To be clear again: everything these people are projecting on this kid may well be going on in his head. I can't read his mind, nor am I taking the statement his parents paid lawyers to help him write at face value. I do not know what he was thinking. But neither, outraged friends, can you. Here's where it gets personal. For reasons I do not yet understand, but that are, at this point in my life (and after decades of effort at counteracting) are plainly beyond my control, I am cursed with resting smirk face. More broadly, I have an affect that is difficult to read. The word that best describes the personality I present to the world is "inscrutable." That would be fine, except that when I'm concentrating on an interaction with another person, my face does something completely beyond my control: my mouth turns up slightly into a smirk. People who don't know me--and sometimes, even people who do--have at times interpreted that look as judgmental or sardonic. Twenty-two years ago, administering a church camp as assistant dean, I had a meeting with angry parents of some African-American campers who'd traveled all the way from Portland to the coast because of an offensive racist incident at an evening program. I wasn't saying much, letting the dean guide the conversation, but I was listening intently, focusing all my intention on one of the parents, when he called me out. "Why are you smirking at me? Do you think this is funny?" I was shocked at what he was reading into my expression, had no idea that's how I'd looked, and tried to assure him that was just my look of concentration, but I don't think he bought it. He'd seen that look on too many white faces before. That's the struggle for me: I really can't control what my face does when I'm focusing all of my attention on being a good listener, trying to understand everything a conversation partner is saying to me. It is absolutely not the face of the thoughtless jerk who made an offensive joke, the entitled kid who doesn't understand what's wrong with a tomahawk chop, the silent know-it-all judging your grammar, or the malicious monster who turns a date into an opportunity for abuse. It's just me wanting to hear what you're saying, having to concentrate extra attention because I don't hear so well in a noisy room, and having a mouth that involuntarily gets smirky when I do. My struggle gets worse: when I'm in a situation that causes me to lock down, unable to decide how to react, whether to act at all, my face sometimes freezes in a smirky rictus. This includes situations in which I'm being victimized. My scared face is sometimes a smirk face. All of this makes me sensitive to anyone rushing to interpret a facial expression, a posture, or any other aspect of appearance. Judging a person based on appearance is literally superficial. It's also a practice every movement for civil rights has fought against. Skin color, clothing choice, wrinkles, hair style, visible deformity, facial structure--any of these criteria for bias against a human being is a violation of the most basic rights of the individual. To put it even more plainly: I'm sorry, friends, but you really don't know what's going on in that kid's head. I don't either. As I stated earlier, I don't think he, or any of his far more rambunctious buddies, should've been there, and it's an embarrassment to both their school and the Catholic diocese that administers it that they were put in that situation. But a frozen expression on the face of a child in a confusing, frightening situation doesn't tell you anything about what's behind that face--anymore than it would tell you I'm silently judging or, even worse, laughing at you with my own low-affect expression.